Spot resin trading was much improved the final week of November; the month had just been sputtering along and thankfully, the strong volumes helped to bring the month up to a solid average. Spot pricing for both Polyethylene and Polypropylene remained weak, with losses of $.01-.02/lb common, depending on grade. The flow of fresh offers was healthy, as most resellers looked to flip domestic railcars rather than take additional material into inventory. Other suppliers with packaged warehoused material ready to go were also eager to sell and eased prices seeking buyers. Processors, who have been enjoying a rare taste of pricing power have been limiting purchases, awaiting cheaper prices - this past week seemed to be one to cover some orders. Contract decreases for both PE and PP were both confirmed for Nov. Export levels have been weakening, as new yearly lows in Crude Oil are working their way downstream into international resin prices. The major energy markets were all higher; crude oil mildly, nat gas significantly. WTI Crude Oil dipped below $50/bbl for the first time in more than a year, then some value buying ensued and the market recovered. The Jan futures contract ended the week at $50.93/bbl, a net gain of $.51/bbl. Although we often hear such rhetoric, oil producers seem ready to cut production to stem the slide driven by surplus supplies. Brent Oil rolled to Feb and saw similar price action as WTI, finishing the week up $.42/bbl to $59.46/bbl. Nat Gas futures continue their volatile ways, swinging around in a massive 18% trading range. When the dust settled, the Jan contract had added $.257/mmBtu, 6%, to end the week at $4.612/mmBtu. Ethane was nearly steady this past week, ticking just a half-cent higher to $.335/gal ($.141/lb). Propane results were about the same, posting a half-cent gain to $.69/gal ($.195/lb). Monomer activity ramped back up post-Thanksgiving as traders found ample opportunity to transact. Early in the week Ethylene garnered heavy volume at the prevailing price of $.20/lb. Bids and offers remained abundant throughout the week, and while trades continued to cross, the price was still pegged at $.20/lb. 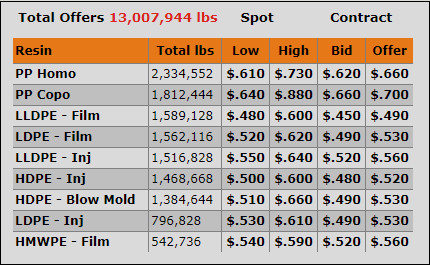 Ethylene in Choctaw, LA maintained its $.02/lb premium over material in Texas. Propylene trading was very active, early in the week transacted volumes were high, with Nov and Dec priced mostly steady around $.46/lb. 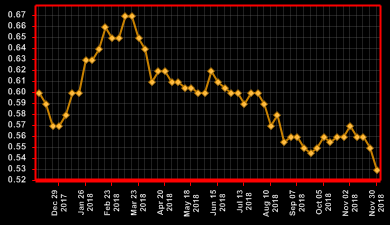 Deals were done through all of 2019, with the contango shaped curve reaching $.49/lb by Dec, 2019. Then midweek, the market proceeded to collapse and massive losses were endured. Pricing eroded in chunks, and by Friday, December PGP was valued at just $.385/lb, down an astounding $.08/lb on the week. 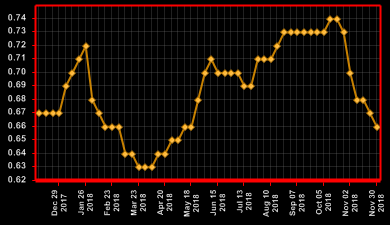 November PGP contracts settled late in the month down a dime at $.50/lb. Current spot levels indicate that a similar drop could be seen for Dec contracts, but it’s still early in the month so plenty can change. The Polyethylene market had been relatively anemic during much of November, but it sprang back to life just in time to salvage the month. Transacted volumes increased significantly, nearly matching the previous three weeks combined. Fresh offerings were heavy and spot prices continued to slide, with additional losses of $.01-.02/lb widespread, bringing new lows for the year. After another unsuccessful attempt to implement a $.03/lb increase in Nov, producers began to acquiesce to customer demand for price relief and provided a $.03/lb decrease instead. Although oil prices stopped sliding, the overall weakness has lowered export prices so Houston warehouses have been slammed with packaging requests. This market dynamic has forced producers to drop their asking prices to compete with other international regions, which has spilled over into the domestic market. Buyers were driven back to the market for different reasons, some needed to procure minimal spot material to keep their plants running, while others, pleased with the recent price decline, ordered a bit more to both use and add to their coffers. Some processors have reported that their end-user demand has slowed and simply do not have the orders to maintain the purchasing pace they had during 2018. There could be more downside in December. In contrast to the rest of November, Polypropylene trading perked up substantially as the month drew to a close. Both the flow of offers and completed volumes were above average, while prices shed another cent. Volumes favored CoPP over HoPP and Prime was preferred to Offgrade. Resellers and traders alike came to the market to procure material that seemed to be on sale. Asking prices for Prime railcars were often quoted as a premium over contract monomer; not only has monomer fallen, but we have also seen this premium erode nearly a dime from peak pricing. November PP contracts averaged a $.10/lb decrease and given current PGP monomer prices, another large decrease is anticipated for December. The sharp and swift market correction has shut down the import arbitrage; therefore, we expect much fewer speculative pounds inbound during December, which could eventually lead to a lack of PP supply early in the New Year.